Children’s toys are meant to be a source of surprise and pleasure, but they are also tools that promote healthy age-appropriate play. We have some tips to help you select gifts that are good—and also good for your children’s health and development. Healthy habits can serve your child for a lifetime. It’s easy to be swept away in the sugarplum fancies of the holidays, but the gifts we choose for our children have importance beyond their ability to dazzle. Playthings influence the physical, mental, social, and emotional development of young children. We want our children’s toys to be fun, but it’s also important to select toys that are developmentally stimulating. It’s never too soon to encourage activities that support healthy bones. Young children are developing motor skills and life habits. Toys that encourage learning and physical activity are much healthier for a child than toys providing passive entertainment. You want your child, and not your child’s toy, to direct playtime. Dolls, stuffed animals, or games that talk or sing at the press of a button create a play experience that is more passive than active. Simple toys like blocks encourage children to use their imagination and creativity. Research suggests that electronic toys pose several dangers for children. Loud toys may cause hearing loss. Passively watching a screen can cause weight gain and developmental delays. Lots of flashing lights and movement can affect a child’s attention span and make it more difficult for them to focus. For these reasons, the American Academy of Pediatrics recommends that children under age two shouldn’t watch TV or play any computer games and children over two years of age should be limited to no more than two hours of screen time a day. Some toy companies play on parental concerns about helping their children learn as quickly as possible. A Kaiser Foundation report reviewed the claims of toys claiming to boost brain development, reading ability or mathematical skills in babies and young children. The report conclusion? Many of these claims are unsupported. The best educational toys are the tried and true options that have been building creative thinkers for decades. The holidays are a wonderful time to present the youngsters on your list with toys that will intrigue them, and that will encourage them to develop a healthy level of physical activity while appropriately challenging them to develop and grow. 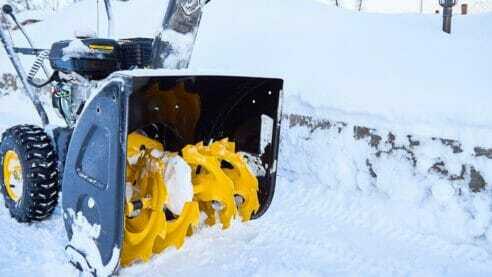 Awareness of injury risks is the first step to practicing snowblower safety this winter.